Our range of products include spiral sleeves. 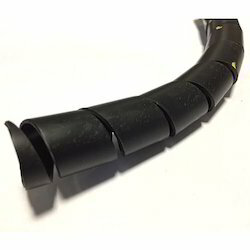 Our clients can avail from us a wide range of spiral sleeves that are used as protectors for rubber hoses and electric wiring. These are manufactured using state-of-the-art machinery and latest techniques that ensure its durability. In addition, our range of spiral sleeves is thoroughly checked at every stage of production.